Zentech manufactures portable and mobile heat treatment equipment, high-tech stress relieving and preheating units designed for variety of heat treatment processes. Our design includes state-of-the-art control technology as well as safety systems. We have a comprehensive understanding of heat treating methods and technology. The benefits to our clients are more precise heat treating, less time on the job and more cost-effective operation. To ensure accuracy, our equipment is calibrated to national standards. 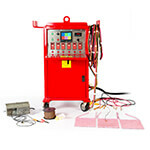 The Zentech gas trains contain the equipment necessary to perform internal fired post weld heat treatment. 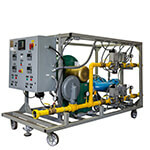 The gas train can be run automatically or manually, and the temperature controller ensures the proper temperature is maintained throughout the heat cycle by regulating the flow of gas to the burner. The high limit controller assures that the maximum allowable temperature will not be surpassed. 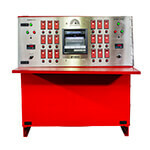 The built in safety features check for correct fuel pressure, monitor the flame in the burner and shut down the fuel supply in the event of flame loss. Safeguards / contingency features are managed through alarms and flame safety equipment built in the gas train. The blower provides air to mix with incoming gas to alter the temperature of the flame from the burner for proper control of the heat cycle. The blower is connected to the gas train, which in turn controls the flow of air provided for the burner. Designed to deliver more, ThermJet burners represent a technological leap forward in every area of design and performance that counts. ThermJet burners set new standards for velocity, emissions and flexibility.